The Galaxy Tab 4 NOOK, as delivered, uses the very basic one-finger left-to-right unlock pattern, which is essentially an open door. Anyone picking up your tablet is almost certain to quickly stumble upon that insecure gesture. In the left panel, in the Sound and Display section, tap Display. In the right panel, tap Screen Timeout. Touch to fill in one of the bubbles. For most users, a safe amount of time is between 2 and 10 minutes. You can manually lock the screen by briefly pressing the Power/Lock key on the right side of the tablet. Once you’ve set up your new Tab 4 NOOK, and before you leave it unguarded (or take it out of your home or office), require a password. In the left panel, in the Personalization section, tap Lock Screen. In the right panel, in the Screen Security section, tap Screen Lock. Swipe. This is no lock at all. You’re improving upon this right now. Pattern. The screen displays nine dots in a three-by-three pattern. Set a pattern by tapping any one dot; keep your finger on the screen as you move to other dots on the screen. Don’t use an obvious pattern like a box or a line. The pattern lock can start at any dot. PIN. If you’re numerically inclined, choose a personal identification number; you can use any combination of numbers with as many as 16 digits. Password. Create a password of as many as 16 characters, numbers, or symbols. Again, don’t be obvious. “Password” isn’t a good password. Neither is your name. Try a phone number or address that has no direct connection to you but which you can recall from memory. An old phone number of a distant relative? The street address of the post office in the town you lived in three jobs ago? Oh, and don’t write it down on a sticky note applied to the bottom of the tablet. None. This is really, truly no lock at all. Any time the tablet is turned on, anyone can use it. This may seem like a good choice to someone for some reason. Clock Widget. You can choose a clock size for your Home screens, and decide whether you want to see the current date. Personal Message. You can put in, “Greetings, earthlings. I come in peace.” Or anything else. Keep it clean, people. Owner Information. You can list your name and other information on the Lock screen, in hopes that a good Samaritan would return it. Tap Owner Information; then tap Show Owner Info on Lock Screen to enable or disable the option. Touch in the text field to type. Lock Automatically. 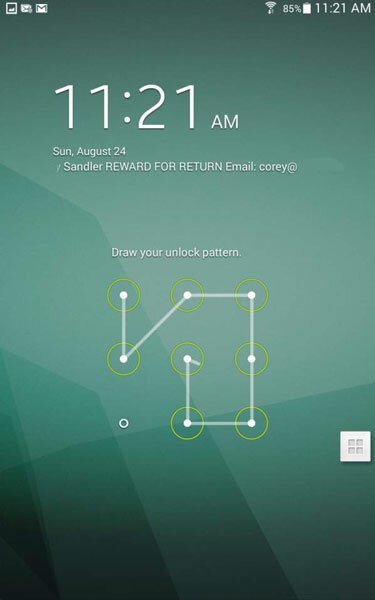 Say how quickly to lock the screen after the screen automatically turns off. Lock Instantly with Power/Lock Key. Use this option to enable the Lock screen when the Power/Lock key is pressed. If you don’t enable this option, the screen dims or brightens when the Power/Lock key is briefly pressed, but won’t lock. Make Pattern Visible. If you choose the pattern, this option lets you see the traces of your pattern as you draw it. Make Passwords Visible. If you choose to use the password, this option lets you see the characters as you type; they appear onscreen briefly and then disappear. Make PIN Visible. If you choose the PIN, this option lets you see the numbers as you enter them; they appear onscreen briefly and then disappear.